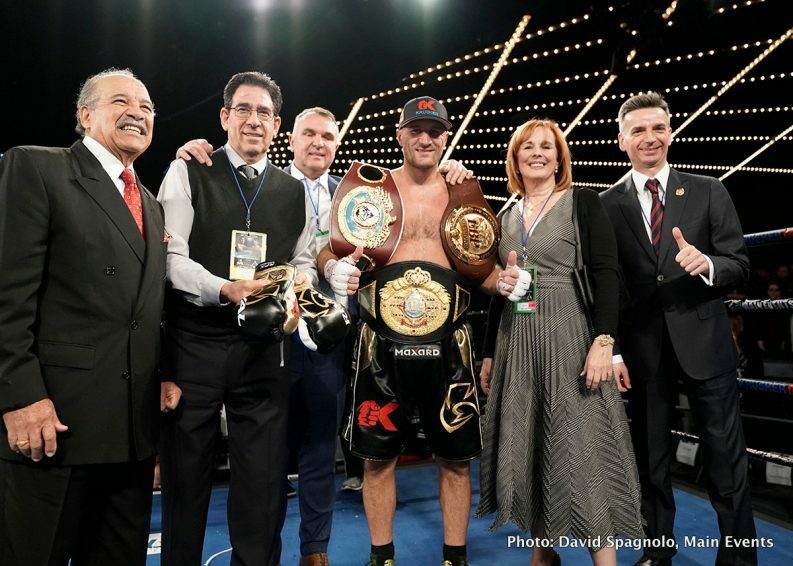 Sergey “Krusher” Kovalev (32-2-1, 28 KOs) of Russia delivered another trademark crushing performance with a seventh round stoppage of Igor Mikhalkin(21-2, 9 KOs) of Russia at The Theater at Madison Square Garden to retain his WBO World Light Heavyweight Championship. 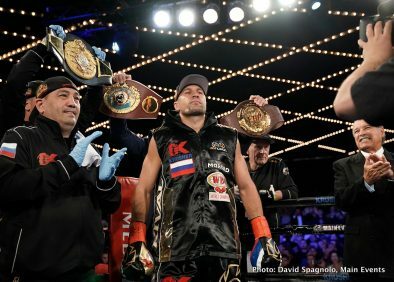 Despite their friendship, there was no love lost between Russian countrymen as Kovalev made Mikhalkin feel the heat from the opening bell. Through the first six rounds, Kovalev out landed Mikhalkin 145 to 25 punches, according to CompuBox. 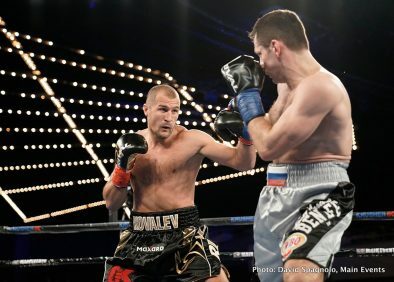 Nevertheless, Mikhalkin is a world champion, and stayed in Kovalev’s face. 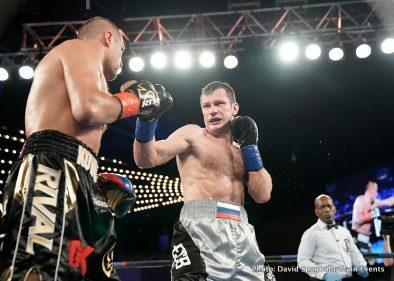 A cut opened below Mikhalkin’s right eye, and as Kovalev continued to punish him, referee Steve Willis stepped in to have the ringside physician examine Mikhalkin. 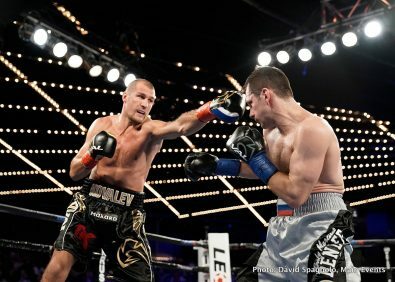 He determined Mikhalkin could not continue, delivering a TKO victory to Kovalev at 2:25 of the seventh round. Vaughn “Da Animal” Alexander(12-0, 8 KOs) of St. Louis, Missouri remained undefeated in his second appearance at Madison Square Garden, 14 years after his original 2004 victory. Alexander won a ten-round unanimous decision over a tough as nails Devaun Lee(10-3-1, 5 KOs) of Brooklyn, New York, who took the fight on barely two days’ notice. Brooklyn’s own Frank “Notorious” Galarza (19-2-2, 11 KOs) battled a determined Norberto Gonzalez (24-11, 14 KOs) of Monterrey, Mexico in an eight-round junior middleweight contest. The local hero delivered a unanimous decision victory by scores of 80-72, 79-73, and 78-74. Galarza, 32, traded shots with Gonzalez, but was in control of the action and directed the path of the fight throughout as his devoted fans cheered him on. The veteran Mexican, 36, took the fight on short notice and acquitted himself well with his effort. Galarza thanked all the fans who came to The Garden to see him. Bakhram Murtazaliev (12-0, 10 KOs) of Grozny, Russia extended his knockout streak to eight, stopping Kenneth McNeil (11-4, 8 KOs) of Birmingham, Alabama, in the first defense of the IBA Super Welterweight World Title he won at The Garden in November. Murtazaliev let out a roar of satisfaction as referee Danny Schiavone halted the contest at 1:08 of the fifth round. “For all my team, Egis (Klimas), for Kathy Duva, for all the team, they helped me a lot. My goal is to make you happy, every fight,” added Murtazaliev. McNeil had never been stopped before, giving Murtazaliev, 25, the most significant test of his career to date. It was the Russian’s third fight under both the Krusher Promotions and Main Events banners. Meiirim “The Sultan” Nursultanov (6-0, 5 KOs) worked hard to stop a tough Alejandro Torres (9-4-2, 4 KOs) of Monterrey, Mexico at 1:55 of the sixth round in front of a robust cheering section at The Garden of his enthusiastic Kazakh fans. He has now stopped his last four opponents. “The Mexican offense is very different style, this Mexican Style for me,” said Nursultanov of Torres. “My training camp was very good, I sparred many different guys” in preparation for Torres. Cassius Chaney(12-0, 6 KOs) of Baltimore delivered the big heavyweight show he promised, stopping Tim Washington(6-6, 6 KOs) of Toledo, Ohio at 1:28 of the second round to remain undefeated. “It was a good fight, he’s a big strong guy,” said Chaney. “I did what I had to do to win. I’m happy that Main Events allowed me to fight here at MSG and I’m glad I put on a show. I trained hard and I’m ready to get back in the ring.” Roy Jones, Junior congratulated Chaney backstage on his win. After going to the scorecards due to an accidental headbutt after five rounds, Alexey Evchenko (16-10-1, 6 KOs) of Chelyabinsk, Russia won his American debut in a unanimous decision over Khiary Gray-Pitts (15-4, 11 KOs) of Worcester, Massachusetts in what was a scheduled eight-round welterweight fight. All scorecards read 48-47 at the time of the stoppage. Evchenko, 34, made a solid introduction to American fans with his seventh straight victory. Middleweight Leshawn “Lightning” Rodriguez (9-0, 7 KOs) remained undefeated, winning by unanimous decision over Martez Jackson (4-3-2, 2 KOs) in six rounds. All three judges scored it 58-56. Rodriguez, 24, of Shirley, New York, enjoys a strong fan base in New York going back to his accomplished amateur career. Since his pro debut, he continues to generate fan interest thanks to his take-no-prisoners, hard-hitting style. Jackson, 34, from Atlanta, Georgia, presented Rodriguez his toughest test to date, having never been stopped. Madiyar Ashkeyev (9-0, 5 KOs) of Merki, Kazakhstan made it a brief appearance in the ring after being out over a year due to injury. He stopped Jose Antonio Abreu (13-4, 8 KOs) of La Romana, Dominican Republic at 1:52 of the first round. Ashkeyev, 29, an accomplished amateur now training in Oxnard at the Boxing Laboratory under the guidance of Marco Contreras, faced a dangerous opponent in Abreu, who was in a must-win situation after two straight defeats. Although Abreu beat the count of referee Johnny Callas, Callas stopped the bout. Opening the evening, two-time NY Daily News Golden Gloves Champion Ismael Villarreal(2-0) from the Bronx, New York remained undefeated with a unanimous decision over against Anthony Woods(1-7) of Philadelphia, Pennsylvania. All three judges gave Villarreal the shutout on the scorecards for the four-round super middleweight contest, 40-36. Using a more diversified attack including increased bodywork, Villarreal said after the fight, “I’m happy to come out safe and sound” after fighting Woods, 31, who has never been stopped. Villarreal, 20, son of former super lightweight fighter Otilio Villarreal, is quickly gaining fans and making a name for himself despite also carrying a full course load at Brooklyn Community College.